We've been harvesting cherry tomatoes until they've been coming out of our ears! Nature's candy, I call them and I love them! However, I have to find other ways to use these babies, besides sitting down with a bowl and popping in my mouth one after the other. So, once again, I found this simple, simple easy recipe on Kraft's website. Kraft never seems to fail me. Especially where cream cheese is involved! It literally takes 10 minutes to put 5 ingredients together for your next September soiree with friends. This is so simple and tastes incredibly fresh and fantastic spread on your favorite crackers. 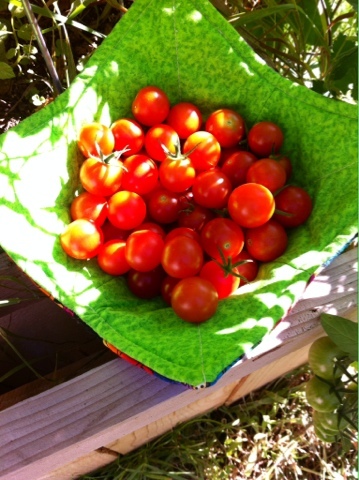 Of course, garden fresh tomatoes bring out the freshness even more. Mister O is the green thumb in the family and I just find the recipes to enjoy their flavor. Spread softened cream cheese on a plate or onto bottom of pie pan. Combine tomatoes and Italian dressing; spread over cream cheese. Top with shredded cheese and basil. That's it! 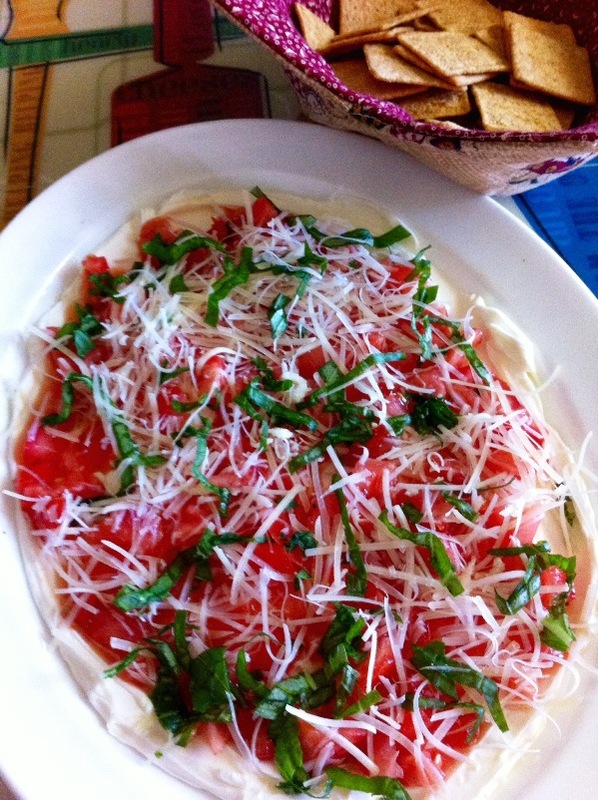 I'm also including the link to Kraft's website Tomato-Basil Dip here for reference. If you like cream cheese and you like tomatoes, then this is right up your garden vine. Start dipping mater fans! Looks simple to make and very yummy! It's so easy Nancy and you can't go wrong with cream cheese! I am up to my eyeballs in tomatoes too but I keep reminding myself how bad tomatoes taste or don't taste in winter! This recipe sounds tasty, I have a ton of basil as well. Haralee, that's great that you have fresh basil too! It's a great combo - hope you try and like it. Sounds yummy! I am going to use this soon for a gathering we have once a month. Thanks! Perfect! Pam, I can tell you that it tastes so fresh and light. Of course, anything with cream cheese is a winner to me!